Sammy the Chinese Dragon makes his presence felt. 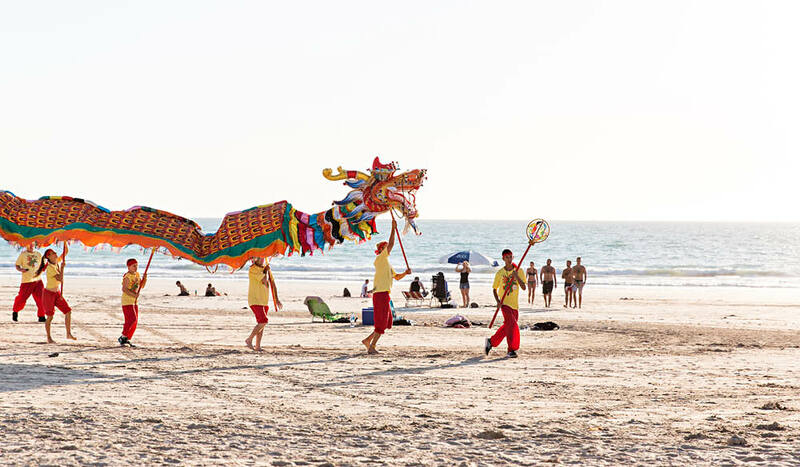 As Broome’s Shinju Matsuri gets set for another year, we take a look at the town’s pearling heritage, and what to do while you’re there – from pearl harvesting to long table dinners on Cable Beach. Linger a little in Broome and pretty soon you’ll start seeing pearls everywhere: in the full moon’s glowing orb as it shines on mudflats, in strings of fairy lights hung above a grassy beer garden, even in the dinner plates of a balmy, open-air restaurant. Call it a lust for lustre, or too much time under the northern sun. Either way, the organic gems, nurtured by the Kimberley region’s immense tropical tides and Tiffany-blue bays, deserve gratitude: without them, Broome and all its sun-kissed holiday escapism might not exist. And then we’d never twig that Broome is also home to the largest dinosaur footprints on Earth, harbours dolphins so rarely spotted that David Attenborough flew in to witness them, and neighbours twin waterfalls that flow, of all things, horizontally. It’s surprising to learn that the pearls we pay thousands for today were once thrown away in lieu of their pearlescent shells. Broome’s Pinctada maxima is the largest pearl shell in the world and from the 1880s onwards, it was punched with circles to make shiny buttons. The ensuing boom meant Japanese, Filipino, Malay, Koepanger and Chinese people flocked to the laid-back frontier town – one of the most remote in the world – but not before local Aboriginals were exploited in the rush for mother of pearl shell. “In the early days, pearl shells were found out on the flats of the beach,” says Bart Pigram, a Yawuru man and leader of Narlijia Cultural Tours, who guides visitors through the historic heart of Broome. “Over time, they had to dive deeper and deeper.” Bart’s UK-born four-times-great-grandfather was one of the early pearlers to engage in the pearling slave trade. A visit to the town’s Pearl Luggers museum lays its ugly history bare: most Aboriginal people were tricked into slavery. Pregnant Indigenous women were particularly favoured as free-divers, due to a belief they could hold their breath for longer – a statue in Pioneer Park pays tribute to them. All divers had to surface with either a shell or sand in their hand to prove they had reached the bottom; holding neither resulted in a beating. In the early 1870s, restrictions were brought in against enslaving Aboriginal people, and female divers banned. Asian immigrants were instead indentured to plunge even deeper beneath the surface wearing heavy, spaceman-like helmets, lead-weighted boots weighing 20 kilograms each and hand knitted woollen undergarments underneath diving suits to brace against the cold. They’d spend up to seven hours underwater, and the survival rate was low. By 1910, Broome was home to more than 400 pearl lugging boats, making it the largest pearling centre in the world. “By the 1940s, there were gambling dens and five brothels in town,” says Bart as we walk beside Broome’s distinguishing corrugated iron buildings with their wraparound, cross-hatch lattice verandahs, designed for air flow. Plenty of interracial relationships blossomed, the multicultural legacy of which characterises the Broome of today. Indeed, Bart’s three-times great grandmother, Agnes ‘Guilwil’ Bryan, was one of the first of Broome’s mixed raced inhabitants – with an English/Irish father and an Aboriginal mother. Pearling is no longer the cash cow of old. The advent of plastic in the 1950s killed the button trade, and although the industry evolved to the point of culturing perfectly spherical pearls as high-value jewellery, it’s an intricate, challenging and expensive game. Today, there’s less than a handful of working pearl farms in the region. Yet Broome is still deeply connected to the pearling trade, and not just as the local adornment of choice. Each September, Shinju Matsuri – Japanese for ‘festival of the pearl’ – bridges the town’s heritage with present-day descendants. Where once there were several cultural celebrations marking the return of pearl luggers, now the 47-year-old festival brings the entire town, and all its visitors, together. The nine-day event symbolically opens with the awakening of Sammy the Chinese Dragon, who dances past festival president Chris Maher, proudly sporting his ‘man strand’ of Cygnet Bay pearls, and darts wildly through opening ceremony crowds. Another night, countless 4WD vehicles flow like ants before a storm to Cable Beach. At sundown, people release hundreds of floating lanterns carrying remembrance messages onto the water. The still ocean is dotted with the flickers of candles, bobbing gently in the shallows. 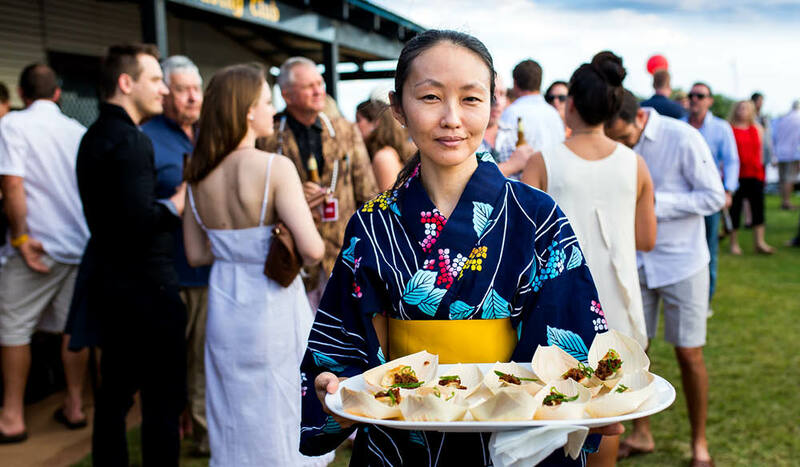 Come Saturday night, the town glams up – many enlisting help from its pearl retailers – for a Sunset Long Table Dinner for 450 on Cable Beach’s sandy expanse. This year, the festival has secured Three Blue Ducks chef Darren Robertson. And last year, celebrity chef Adam Liaw flew in to turn eight kilograms of pearl meat into ceviche, paired with 40 dampers made by a local Indigenous woman. “The menu reflects the culture; Broome is one of few places to have true regional cuisine,” Adam says. “But the sunset is the main hero of the show.” Shinju Matsuri is held from 2–10 September 2017. Across the other side of town, a natural light phenomenon draws people like moths to a flame. Shinju Matsuri always coincides with a full moon, so the illumination event known as Staircase to the Moon can have maximum effect. In the garden party atmosphere of the chic Mangrove Hotel – the best place to see it – the emotive warble of a didgeridoo fills the air as the moon begins its ascent. Its pale reflection in the wet, chiselled mudflats of Roebuck Bay lengthens until it seems as though you could climb up and touch it. Like a pearl, its bewitching existence is inextricably linked to the Kimberley’s massive tides that recede to create its gleaming mud stage. It’s one thing to gaze at dinosaur bones in a museum display, and entirely another to walk beside the 130-million-year-old footprint trail of a huge sauropod, fossilised in ancient rock. 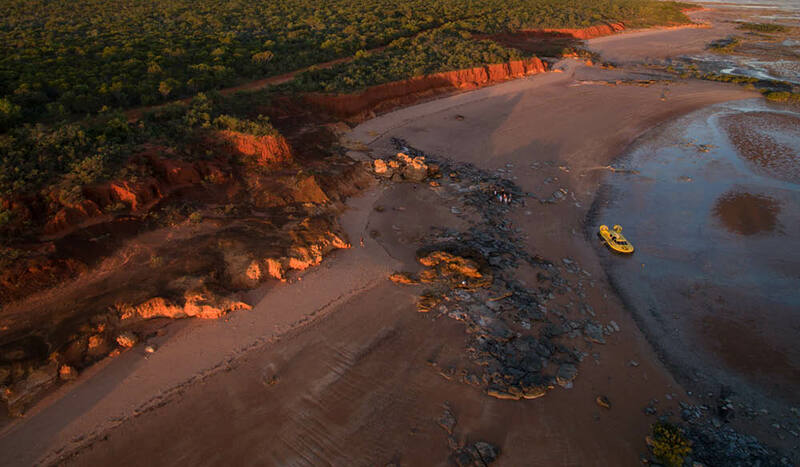 Thousands of dinosaur tracks are scattered across Broome’s rusty red Dampier Peninsula; it harbours the most diverse collection of dinosaur footprints in the world along a 25-kilometre stretch of coastline. There are so many, new ones were momentarily uncovered by the tide on Cable Beach during last year’s Shinju Matsuri. The biggest measure around 1.7 metres long, which is about the height of the average Australian male, officially making them the largest recorded, globally. A palaeontologist who spent six years studying the area recently described it as the “Cretaceous equivalent of the Serengeti” – something local guide, Myles Penegar has suspected for some time. His quirky hovercraft tours whisk people gently across the sand at low tide past turtles, egrets and pelicans to a remote, otherwise inaccessible beach. There, circular sauropod prints are all but invisible until he points out preserved indentations in the rock – after that you can’t miss them. It leaves you in no doubt about dinosaurs’ immense weight; subsurface layers of stone reveal the impact of each step in mind-blowing clarity. They’re cute, they’re rarely seen and David Attenborough rates them enough to include them in his upcoming Blue Planet II series. That’s just three reasons to jump aboard the Broome Whale Watching catamaran to see Broome’s recently discovered snubfin dolphins. Owner and skipper, Cameron Birch, admits they flummoxed him to start with. “I knew so little about them, I thought they were dugongs,” he laughs. With their melon-like heads, fish-sized fins and tri-hued grey skin, it’s an understandable mistake. But where dugongs bob and sink, “snubbys” hunt by spitting three-metre jets through the air, confusing their fishy prey. The endemic species was only recognised in 2005, usually hidden in northern estuaries and rivers. Broome’s were only noticed a couple of years ago and they’re so blissfully at ease in Roebuck Bay’s tidal waters, they’re easily observed. It’s quite something to see a pearl plucked from inside a live, dripping wet oyster. Like a diamond before the stone is polished and cut, the pearl is mottled with plaque-like yellow, its lustre barely perceptible. Harvested during a cruise of Willie Creek Pearl Farm, the chatty guide dips his arms into a sky-blue estuary where cultured pearl beds are strung, filtering the nutrient-rich water. Following a lesson on the intricate art of pearl seeding – where a tiny plastic sphere is tweezered into the oyster – our boat party is filled with tangible appreciation for the pretty spheres we string around our necks and pop in our ears. The farm is found at the end of a bumpy, 38-kilometre outback track, stained the richest paprika tone imaginable. The iron-rich soil dusts the native trees, contrasting against the giant sky dappled with cotton tail clouds – a journey sacrificed if you take the scenic chopper transfer option. 1. Matso’s Brewery – Based in the building that housed Broome’s first bank, you’ll find inventive beers, like mango and chilli, to pair with dishes such as hot-smoked barramundi or ginger beer pork belly. 2. 18 Degrees An open-air tapas bar that specialises in edgy cocktails and friendly service. The barramundi here is a must-try. 3. Cable Beach Club Sunset Bar and Grill – There’s no better place to gaze at a Broome sunset with an icy cold drink in hand. The bar stools out front are hot real estate. 4. Mangrove Hotel – The feel is English garden party-meets-designer bar, with a white-on-white palette, pastel tone patterned tiles and oodles of lush grass. You’ll want to hang out here. 5. Green Mango Cafe Broome – Time casual, this is where you’ll find the best mango smoothies in town, good coffees and filling breakfasts.